Sedlec Ossuary is a bone Church which contains around 70,000 human bones. 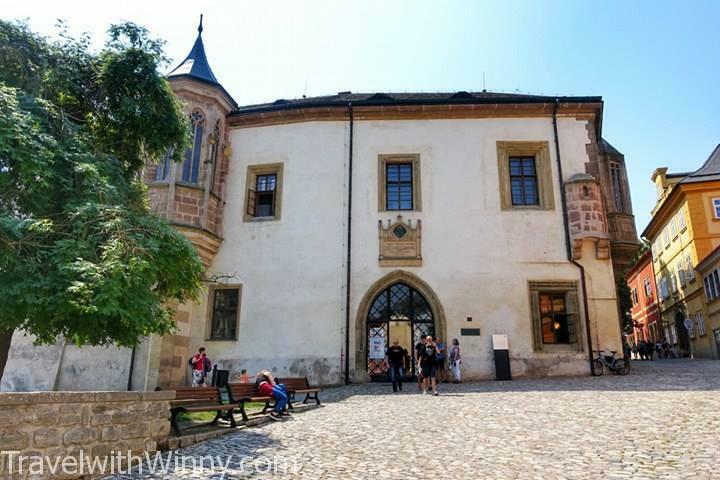 Located in a Kutna Hora, a small town that is 70km away from Prague. It is one of the most fascinating sites in Czech Republic and is on our tick list during our visit to Prague. 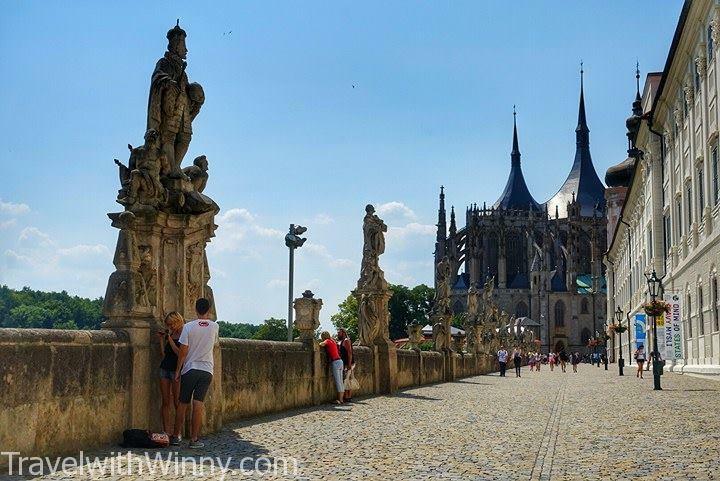 This small town of Kutna Hora used to be the second most important city in the country. 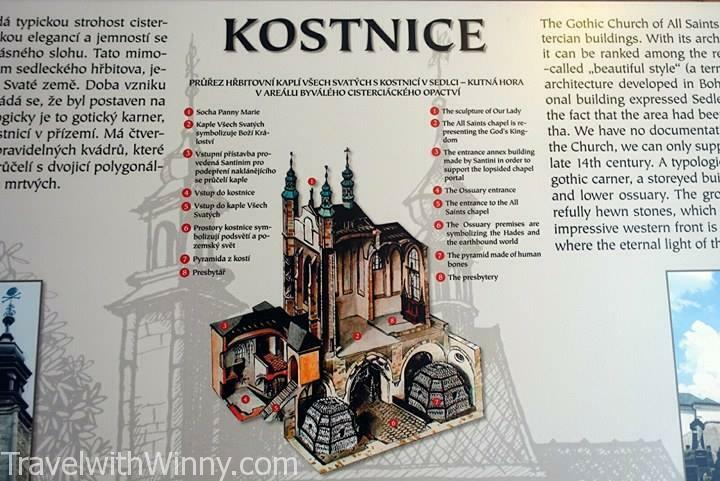 Its richness and cultural significance was comparable to Prague and this wealth came from Kutna Hora’s silver mines. Kunta Hora is a town 70km away from Prague and it’s home to the Bone Church, silver mines and many other UNESCO building. The city of Kutna Hora deteriorated rapidly after the city was burnt during Hussite Wars in 1422. By 1546 the richest silver mine was flooded and matters worsen after the city was devastated by the plague and the Thirty Year’s War. By the 18th century, the silver mines were completely abandoned. Although Kutna Hora today has only a small population with 20 thousand residence, the previous glorious architectures remains. 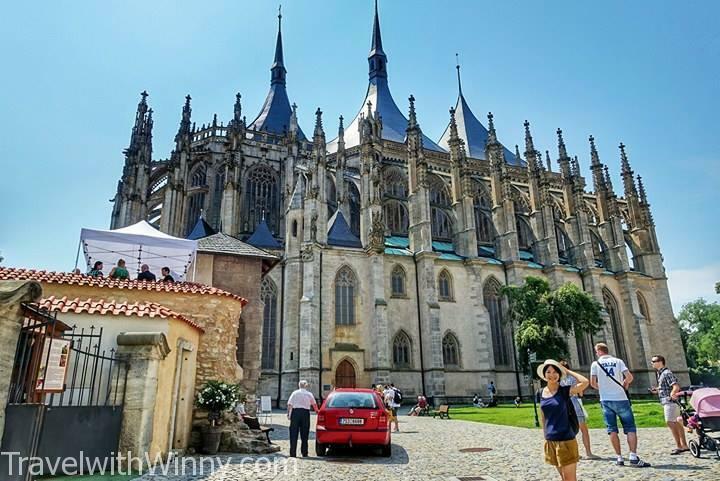 In 1995, three structures in Kutna Hora was listed under UNESCO. St. Barbara’s Church is a UNESCO Roman Catholic Church. It is one of the most famous Gothic churches in Europe. The name St. Barbara is the patron saint of mining, which is highly appropriate for a town that gained all its wealth from silver mining. The construction for this church began in 1388 and the plans for this church was going to be twice the current size. The construction was interrupted by wars. It was only completed almost 600 years later in 1905. The style of architecture of St. Barbara’s Church is very similar to the St. Vitus Cathedral in Prague, but the decoration inside is not as spectacular. The dark Gothic style construction is very different to any other churches/cathedrals in Europe. The size is definitely not something you’ll expect in a small town. It’s unique to see so much impressive structures in a small town. The size of the churches are huge. Besides, the Bone Church, The other UNESCO structure is the Cathedral of Our Lady in Sedlec. Buying all these ticket together can give you a significant discount. 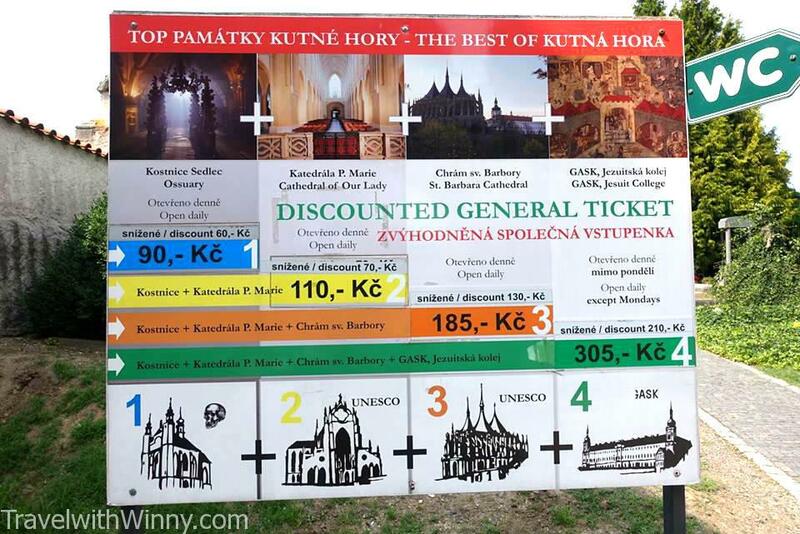 The more you see in Kutna Hora, the cheaper the tickets. 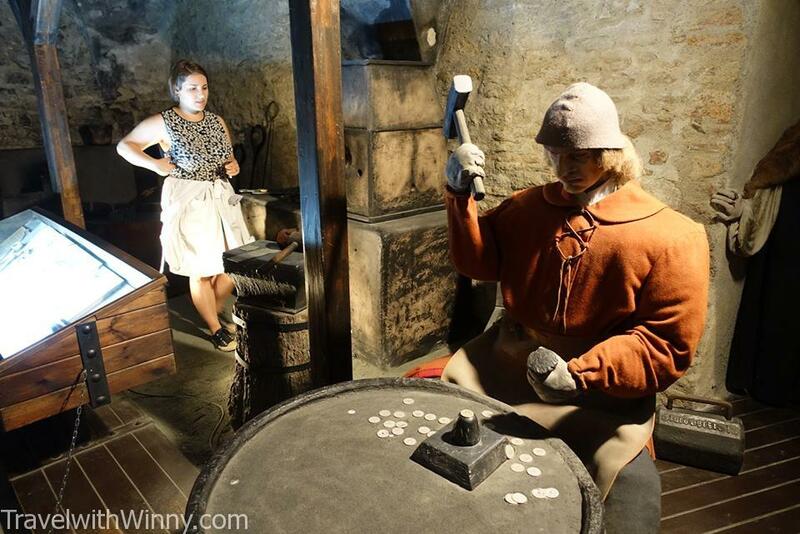 Although the main reason for us to travel to Kutna Hora is to see the Bone Church, but we were quite fascinated with the money driving force in this town, the silver mines. Czech Museum of Silver is definitely not some boring museum. 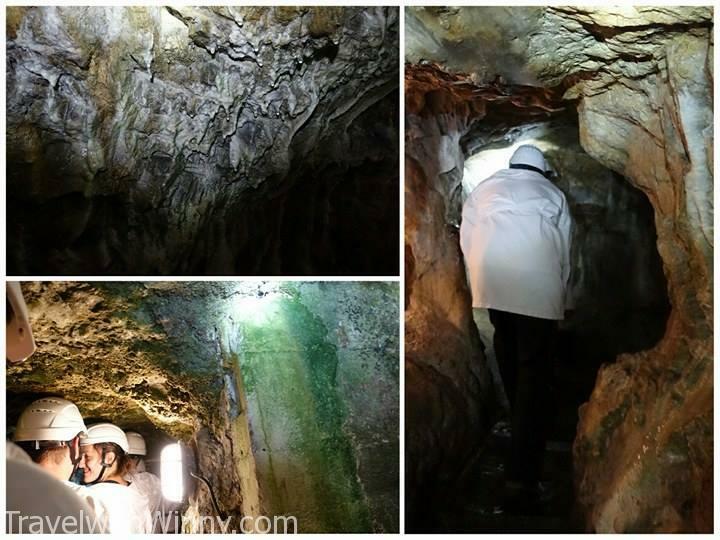 It is a place where you can explore an ancient medieval silver mine and get cramped up in miniature tunnels! 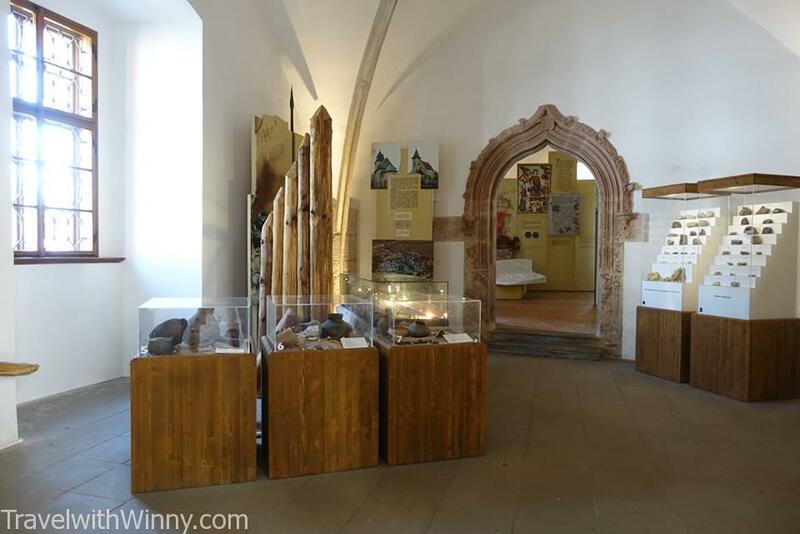 the Czech Museum of Silver is in the city center and you can sign up here for the silver mines. 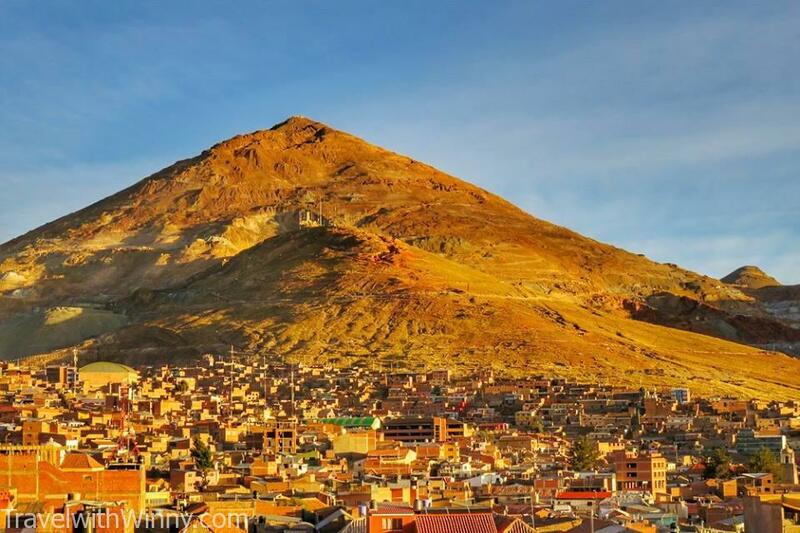 Few months before during our trip in Bolivia, South America, we wanted to visit the mines in Potosi. However at an altitude of 4091 meters, we were experiencing some altitude sickness so we didn’t do mining tour there. The mine in Potosi is still operational and is at a high risk of collapsing. 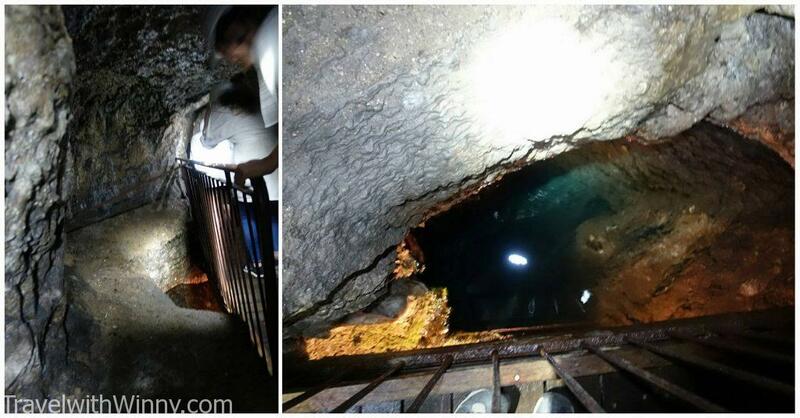 During that tour, you reach 1000 meters below where the air is thin and the temperature is hot. There are also live demolition demonstrations in the Potosi mines. 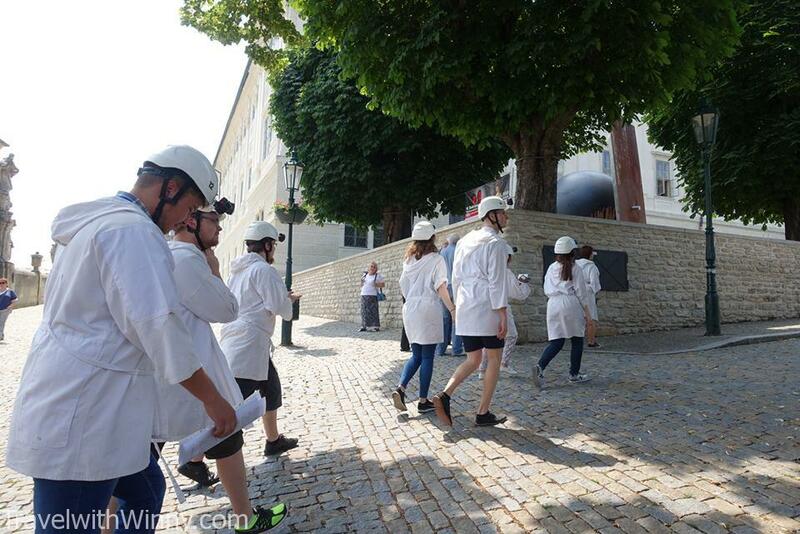 Comparatively, the Silver mine tour in Kutna Hora is significantly safer where children at the age of 6 can join. This is the mine in Potosi. There is a saying that there were enough silver mined here that they could build a bridge to Spain. They could also build another bridge with the bones of the people who died in this mine. There is also a Silver Coin Museum which we were planning to visit. However we were told that the museum could be visited with a guide only and English tours is not available every hour. 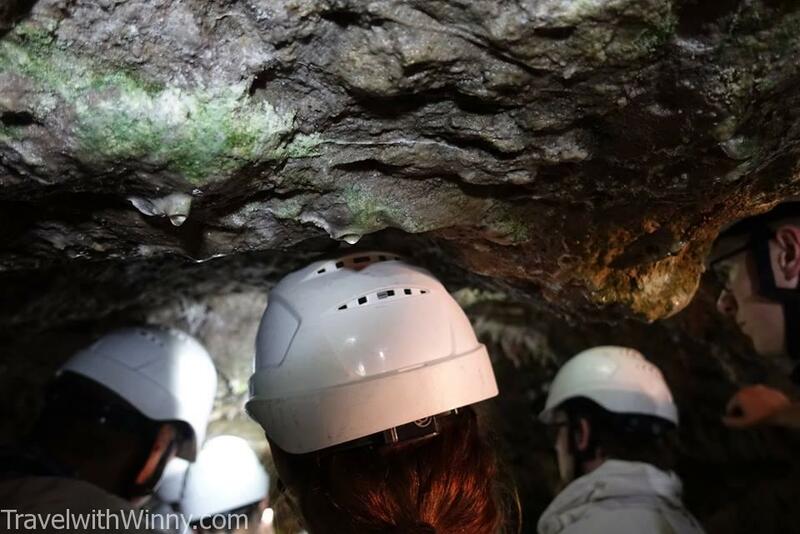 With the time given we could only visit the mines or the museum and of course we chose to do the silver mine. For the latest prices for the silver mine and the museum, please visit their official website. At first we were led to a small cave next to the museum with some fake miners models. This was to test if any of us have any claustrophobia and give us a chance to back out if we felt uncomfortable. The real silver mine tunnel is a lot narrower than this tunnel. This was the fake tunnel which we were visited first to see if we had claustrophobia. After passing the initial “test”, we were led to a place to receive our safety equipment, which was a white robe and a safety helmet. We were told that the medieval miners only wore white robes like this for safety purpose and nothing for the head. We didn’t realize how dangerous this is until we were in the mines whacking our heads on the ceiling of the tunnel thousands of times, no matter how careful we are. Although the safety gear is only a industrial grade helmet and white clothes, it’s a lot compared what the medieval miners wore. The average life expectancy of the miners is less than 40 years of age which is around 10 years shorter than the average life expectancy back in the days. However the pay for miners is around 5 times more than the typical job so are many willing volunteers to do the job. Typically women in this city would marry many times during their life time, as their husbands are miners who commonly lose their lives at work. 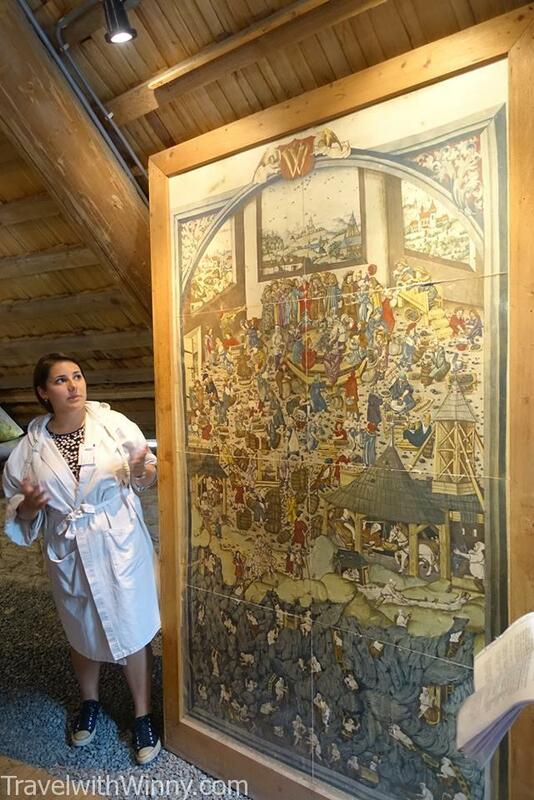 Our guide explaining the average life in Katna Hora back in the medieval times with this copy of old drawing. 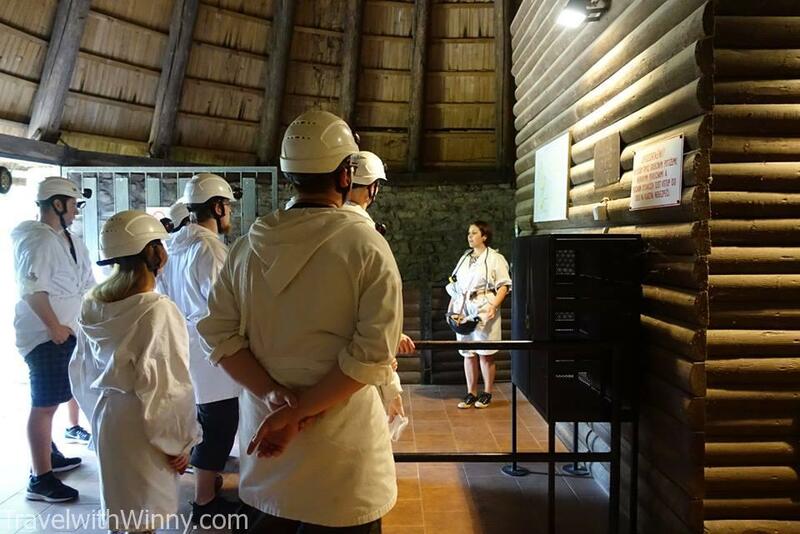 As the entrance to the silver mine is not at the silver coin museum, we were led to the mines on the streets after we are given our safety gear. Many tourists will stop, stare and take pictures of us. Our guide said that this is good advertising for their business. After 10 minutes of walking we reached a building which leads to the silver mine tunnel. We look like a group of cultist with our white hoodies. Many people stop to take pictures of us. The entrance which are led into is a modern tunnel which goes vertically down 35 meters to the first floor of the silver mines. This part of the tunnel is well lit but we were all dizzy after walking down the spiral stairs. We first thought that this silver mine is going to be some sort of modern tunnel. 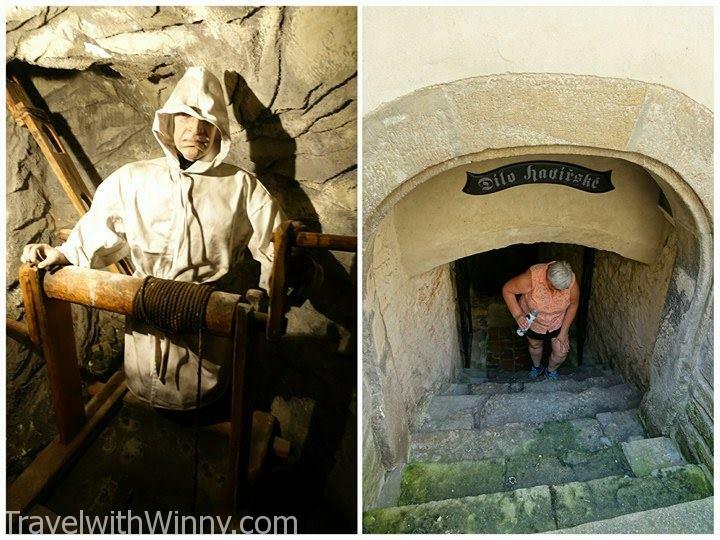 After we reached the first floor of the silver mines, we were in the medieval tunnels and these are extremely narrow. The tunnels here are not so well lit because it is so windy and narrow and the light cannot travel far. We are all equipped with our own light on our helmet so we could all manage to see easily. There were two guides in total, one to lead the way and gave us information and the other was to walk right at the back to make sure none of us get lost. We were constantly knocking our heads on the top of the tunnel. Luckily we had hard hats on! As the average height of men in the middle ages are only 160cm tall, the tunnels are very low. 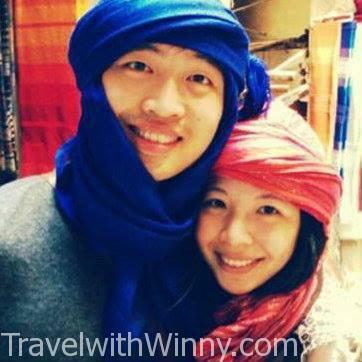 Some parts of the tunnels are only 140cm tall and Winny being only 158cm tall still knocks her head sometimes. On the other hand, I was knocking my head on almost every turn as the height of the tunnel varies so much. Luckily we had a hard hats on. We felt sorry for the very tall Europeans and constantly hear knocking sound of the hard hat on stone ceilings thorough out our tour. The silver mine is like a web like maze but most of the paths are blocked off and two guides made sure that we don’t get lost. To take pictures in the mines, there is a small fee to pay. We were the only person in the group that has purchased this photographing permit. 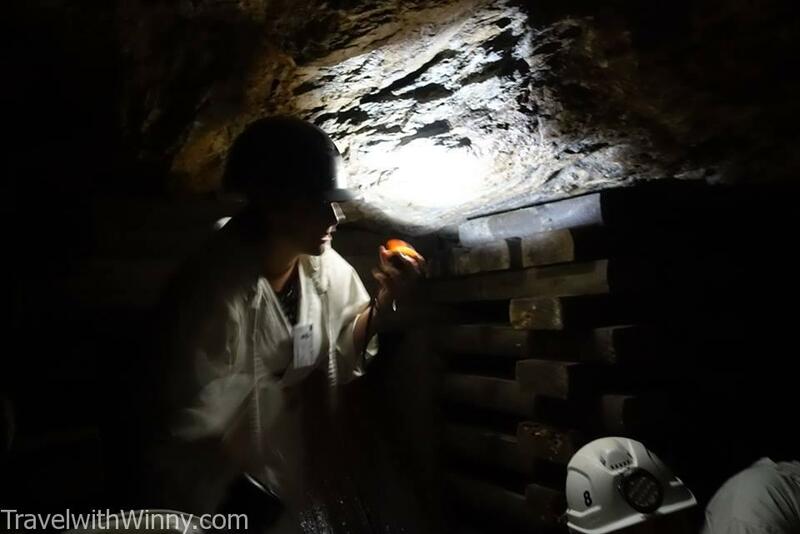 Although it is extremely dim inside the tunnels, our Sony DSC-RX100M III coped with the low light perfectly. The width of the tunnel is a lot narrower than we expected. 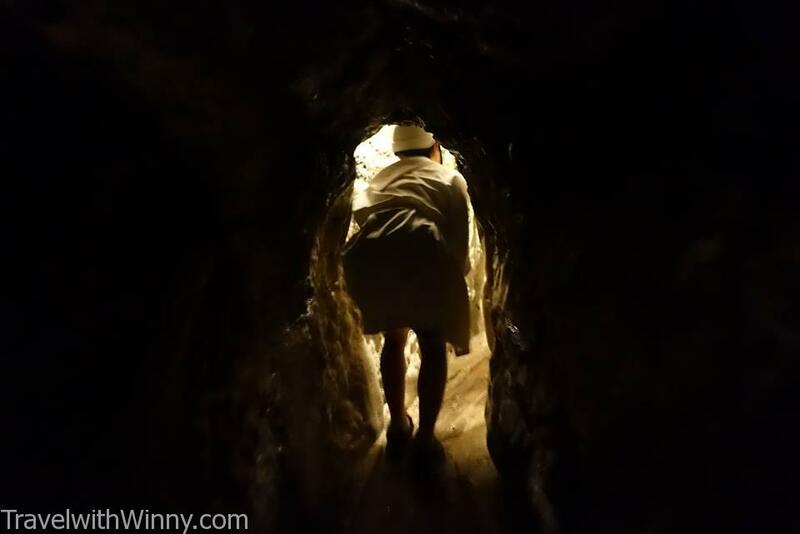 Even a skinny short girl like Winny struggled in some parts of the tunnel. It was a lot of fun exploring! After the guide walks a few minutes, she would try to find a place large enough to fit us all and hear her explanations. Although the widest parts were still quite narrow and we have to strategically place ourselves. 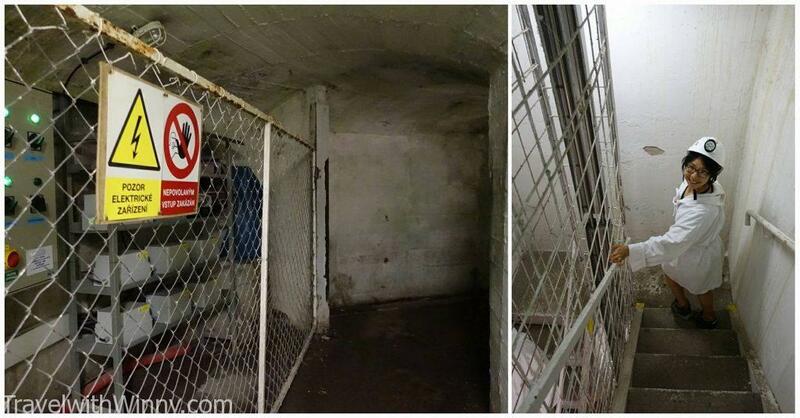 This silver mine is around 400 meters deep and there are 12 floors in total. Unfortunately all except the first floor is flooded so we could only see the lower floors under the water. It’s hard to see in this picture but on a bridge we could see the lower floors of this silver mine. In the tunnels, we were led over a small bridge where we could see some floors below us. Here we could see how deep this place really is. These medieval miners have dug deep extremely deep with very basic tools! Our guide telling us stories of this mine. At a particular location, our guide told us to turn off all our lights to give us a feel how things were in the past. The medieval miners only had small oil lamps held with their thumbs. When the miners run out of oil and light, they had to follow the flow of wind to find their way out in this pitch black narrow tunnel. It must be extremely scary and claustrophobic for them. These tunnels are very tight. I had to walk sideways to get through some parts. The guide said that after the miners finished their work for the day, they would do a head count. If anyone is missing, the whole group would had to go down to find the missing minor. This is becaus the medieval people believed that if they left the dead in the mines, their ghost will haunt the mines. Also a rotting body in the mines is not be pleasant either. After returning to the surface we were told how these silver were extracted and turned into coin. 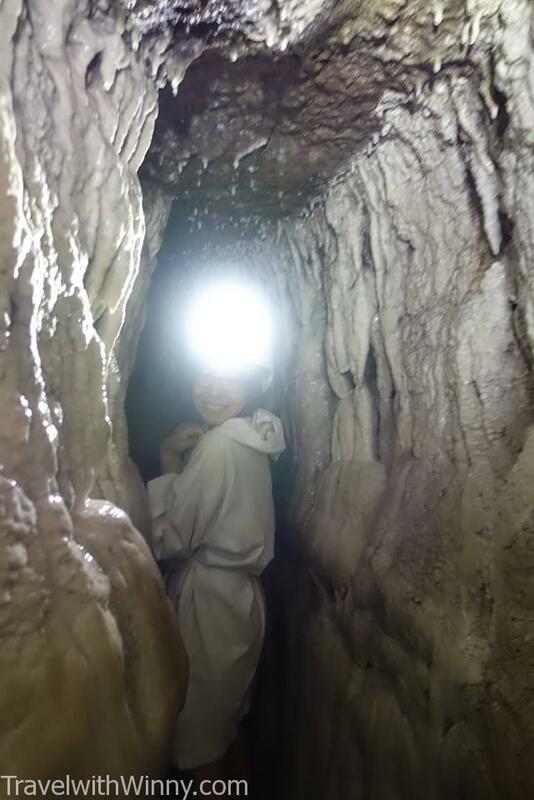 After one hour of head banging in this 250 meters of narrow, claustrophobic silver mines, we finally found day light. Most the tall tourists had bad backs by this time but we all loved the experience. We were then led to another place where we were shown the equipments used by the miners and the way they minted the silver coins. 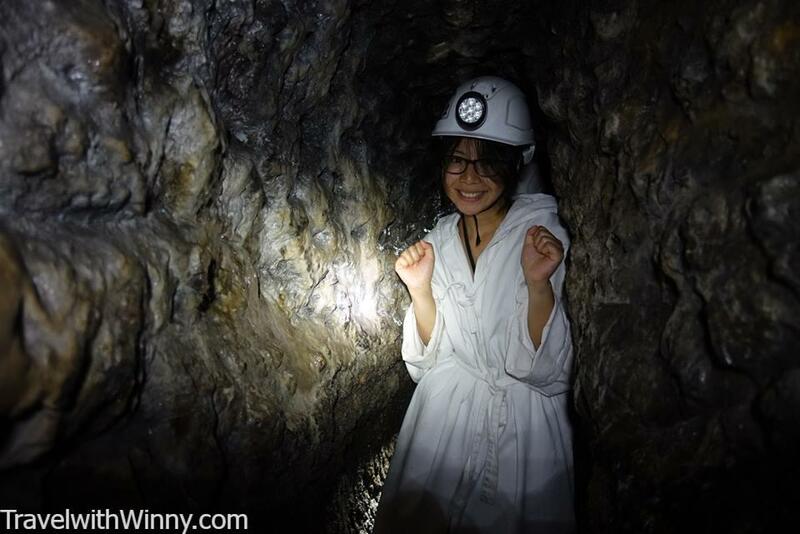 Overall the silver mine tour was very exciting, informative and we highly recommend it! Had to walk like this for some parts of the tunnel! 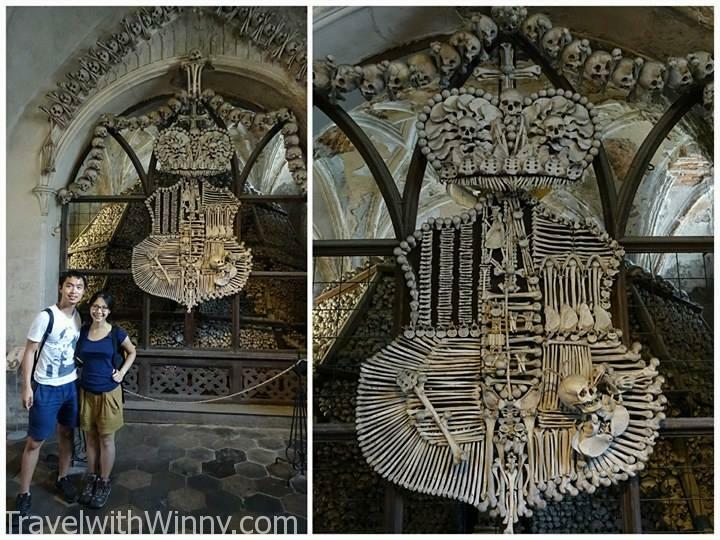 Winny is extremely fascinated with human bones and we definitely won’t be missing out the bone church in Czech Republic! 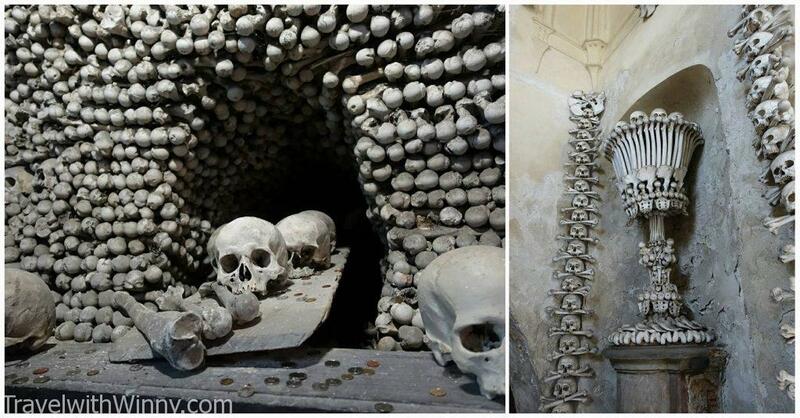 The bone church is a little out of Prague and would usually require a day to visit the place. 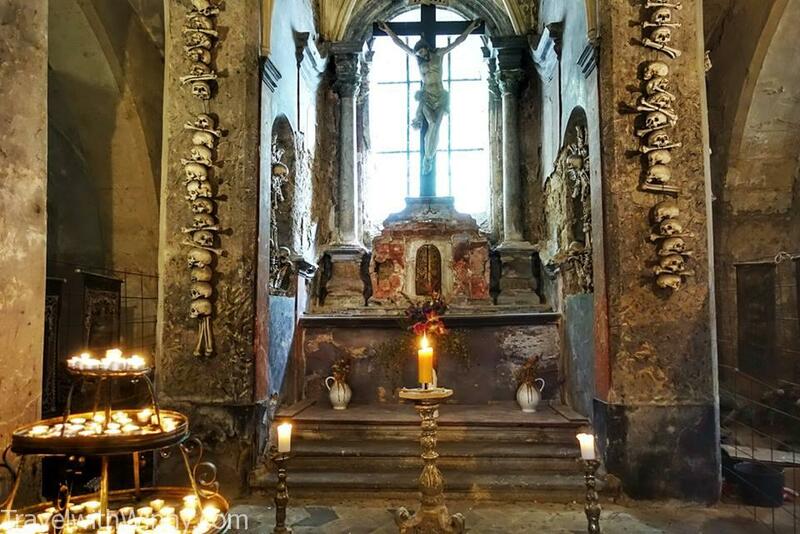 For bone fanatics like Winny, you simply can’t miss the bone church in Czech Republic! 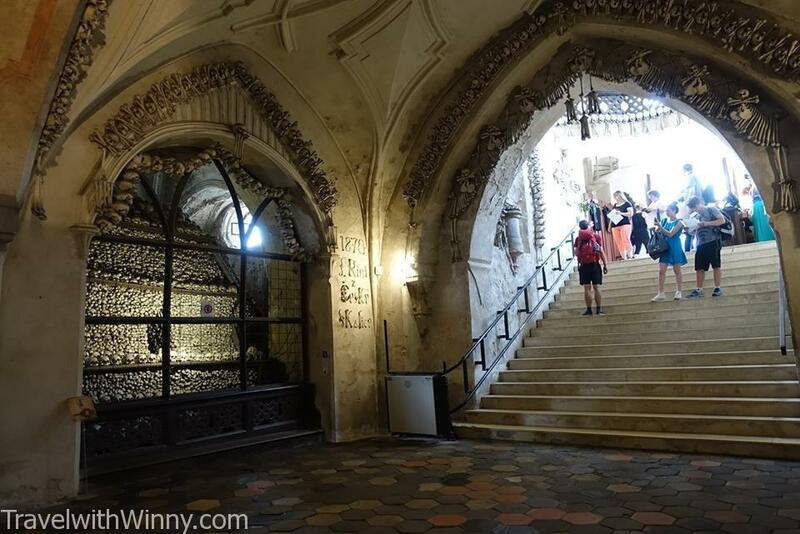 After 85km (1.5hr) bus ride into Kutna Hora, we still need to walk another 1.9km from the main bus station to see the bone church, Sedlec Ossuary. 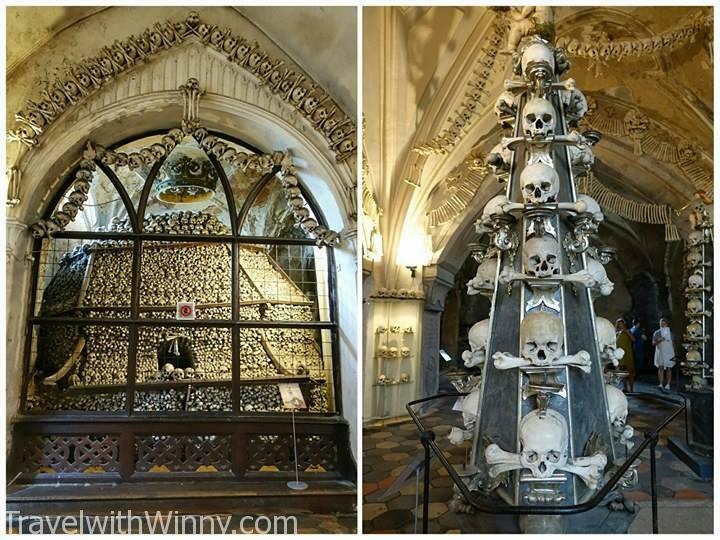 The bone church is one of the most popular destination in Czech Republic with more than 200 thousand people visiting per year. Hence once we saw a bunch of tourists, we realized that we were close to the Bone Church. The exterior of the church isn’t extra ordinary. Originally, the land where the Bone Church is currently located is a insignificant grave yard. In 1278, an abbot was sent to the Holy Land by the king to collect soil to sprinkle over this cemetery. After that, the cemetery became a very desirable burial site in Central Europe. A cross section of the bone church. There is an upper and lower chapel and the bones are piled in the lower chapel. After the Black Death and Hussite Wars in 14th century, many thousands of people were buried in this cemetery. 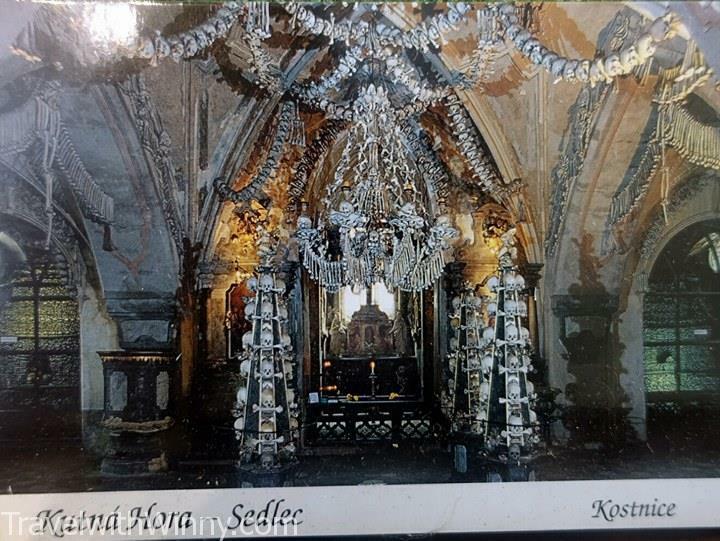 Around 1400, the Sedlec Ossuary church was erected in the center of the cemetery and as a result, large amount of graves were unearth to make way for this church. The unearthed bones were piled into the lower chapel after the church is constructed. As soon as you enter the lower chapel in the bone church, you see four huge triangular mounds of human bones. No historians were ever sure why these bones were piled up in these particular way. The task to stack these bones were given to a half-blind monk in 1511. Rumor claimed that the monk gained his eye sight back after finishing stacking all the human bones. 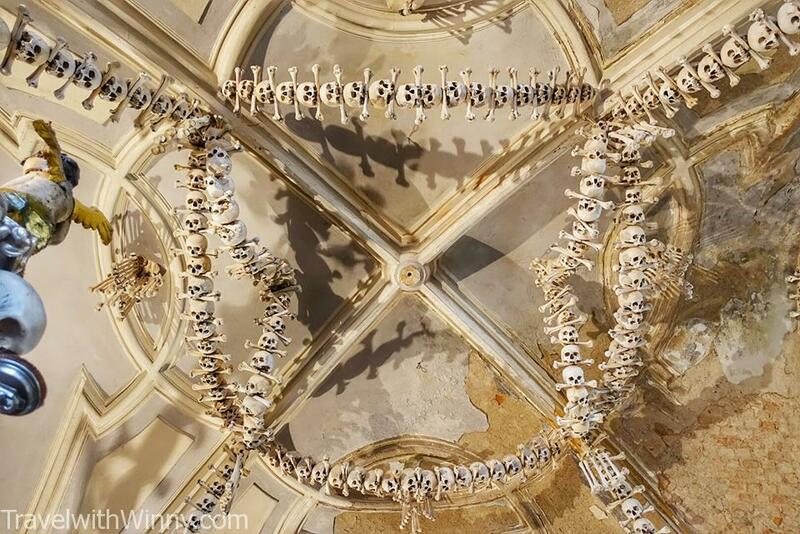 Today we are left with these beautiful bone art in the Bone Church. The bones were for decorations in many ways. What was devastating for us was that the most signature bone chandelier was being renovated so it wasn’t on display that day. As a result, the whole Bone Church wasn’t as impressive as we have expected. Especially the amount of bones seems significantly less than the Paris Catacombs which we visited last year. This is where the bone chandelier suppose to be! There were still around 70 thousand skeletons in this small church, so overall the bone church was still quite amazing, especially the Schwarzenberg family emblem. It is an emblem that uses the fine bones in the skeleton to skillfully piece together. The Schwarzenberg emblem is not very big but is beautiful. The second most beautiful item after the bone chandelier in the bone church. 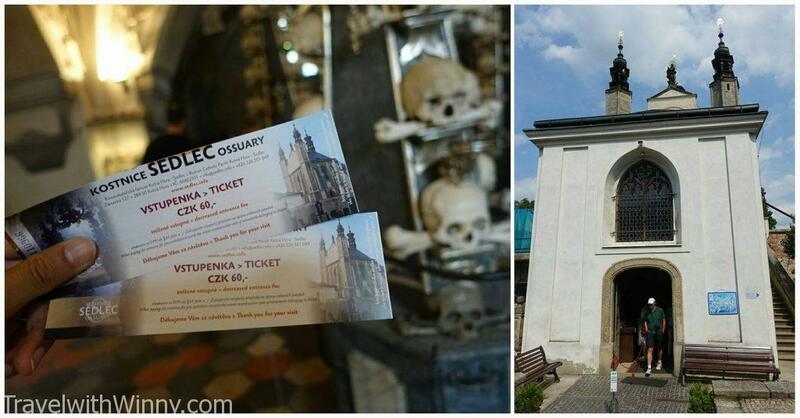 Personally we thought travelling all the way to Kutna Hora just to see the bone church is not worthwhile. The bone church is a lot smaller than what we expected. The amount of bones is not impressive compared to the Paris Catacomb. 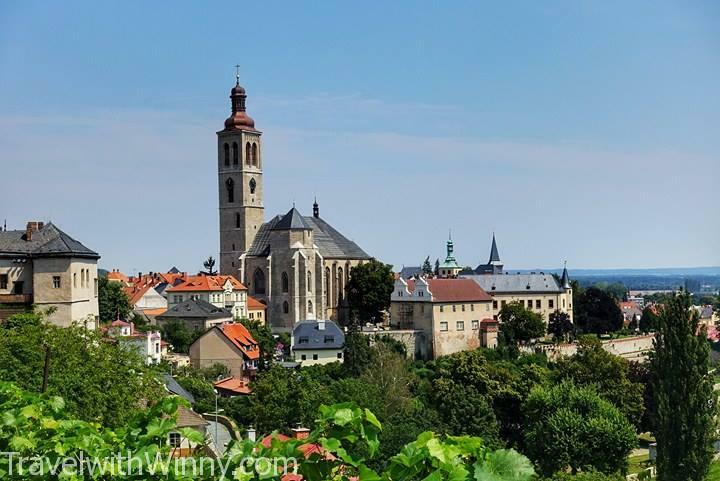 We do recommend fitting it as part of a day tour to Kutna Hora and see all other interesting places in this once glory silver mining town! After all the bone church is still a church, so there is an altar to pray. The cheapest way is to catch public transport. First you catch the metro or bus to the Háje bus station. At Háje, take Bus No. 381 to Kutna Hora. The bus trip 1.5hrs for 70 CZK. The times are available on Google map search or on this website. You could also get to Kutna Hora by train but we thought it’s a more complicated way as we would have to transfer at the train station. This is the bone chandelier which we didn’t get to see!